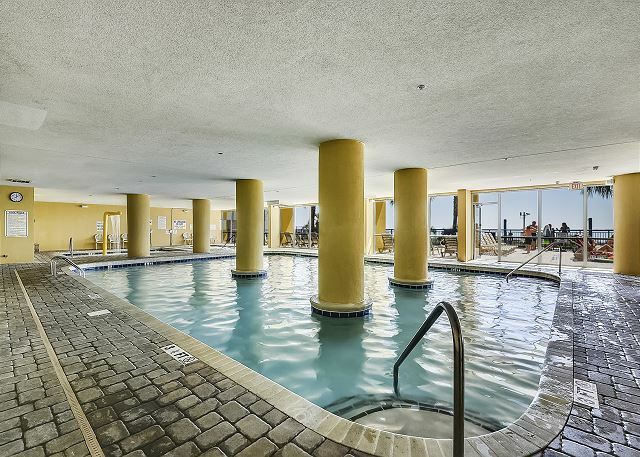 Grand Atlantic Resort is 2 blocks away, enjoy beach and pool access. Less than .01 mile, around a 3 minute walk. 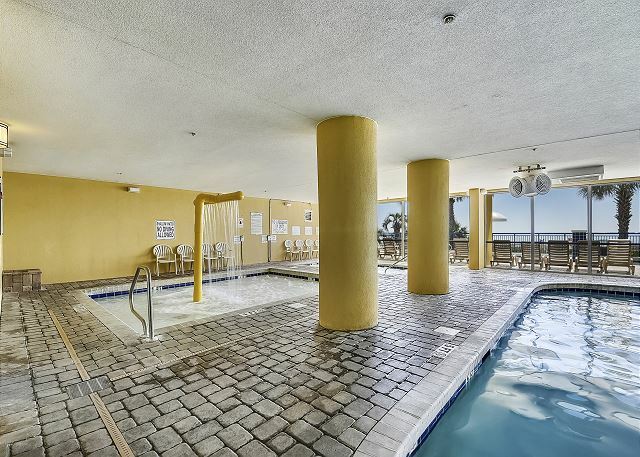 Beach is only 2 blocks away! 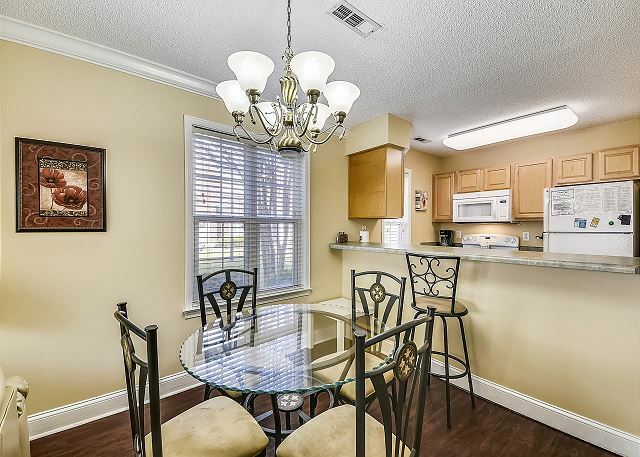 Dining area Beach is only 2 blocks away! 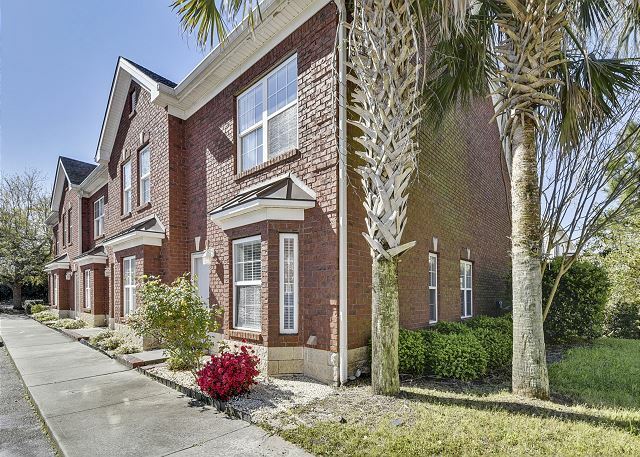 Enjoy the comforts of this bright and cheerfully decorated 2 story, 2 bedroom, 2.5 bath town home,only a short walk to the beach! 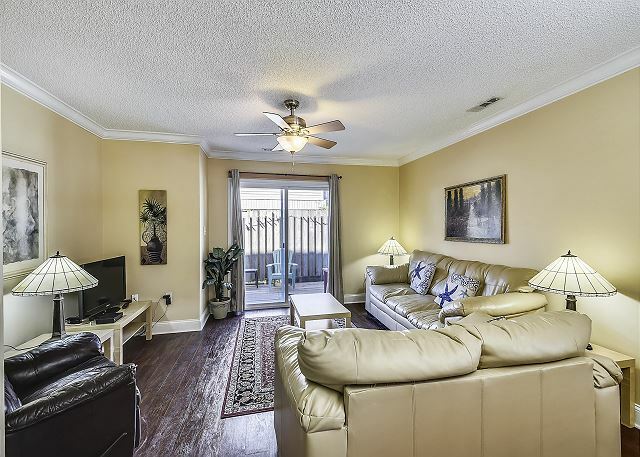 Part of a small quiet community, this spacious and well kept end unit boasts palm trees and parking right out front! 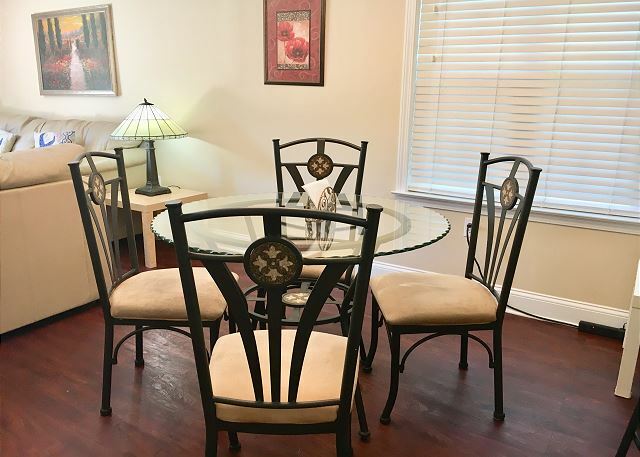 An excellent location puts you close to all the major attractions- a perfect place for your family vacation, couples trip, guys golfing getaway or girls time away. Pet friendly-Dogs under 30lbs only. 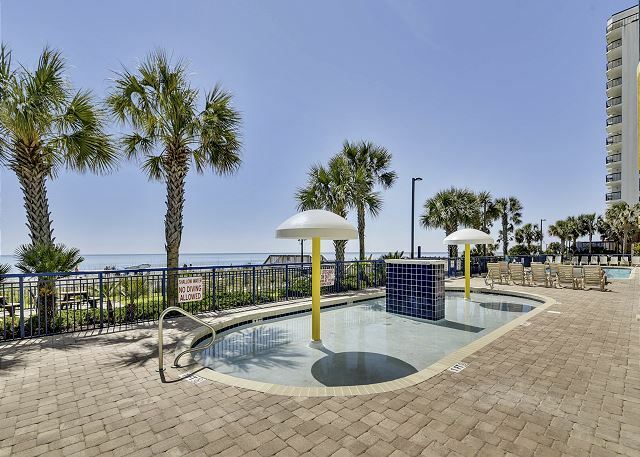 This property also enjoys Ocean Front Amenities at Grand Atlantic Resort. This added bonus was awarded to Firebird #1-5 only. 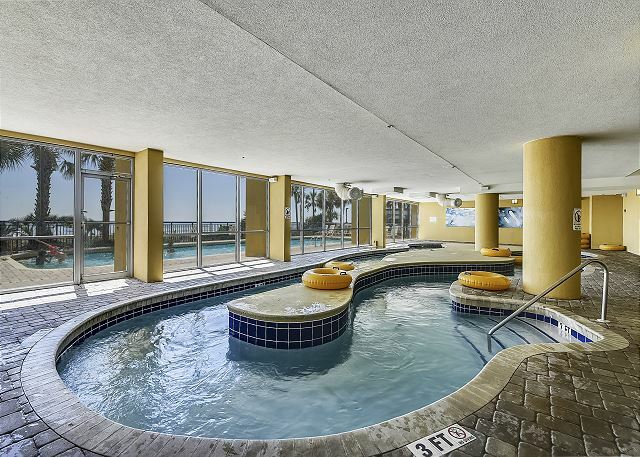 You will love the heated indoor lazy river and pool, the ocean front seating, the outdoor ocean front pools, and the kiddie pools. 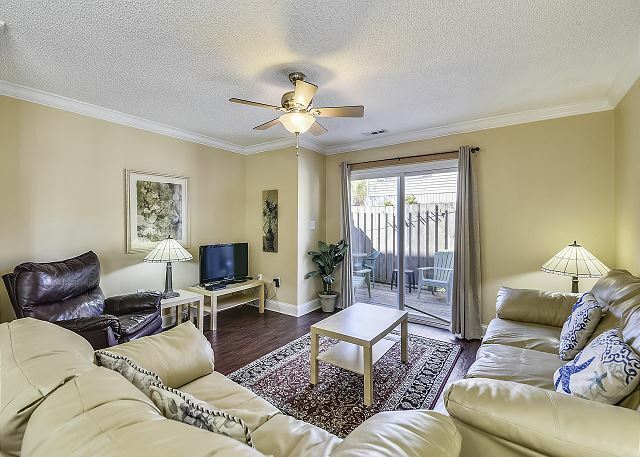 Living Area - Comfortable Seating, cable TV, Free Wireless Internet. 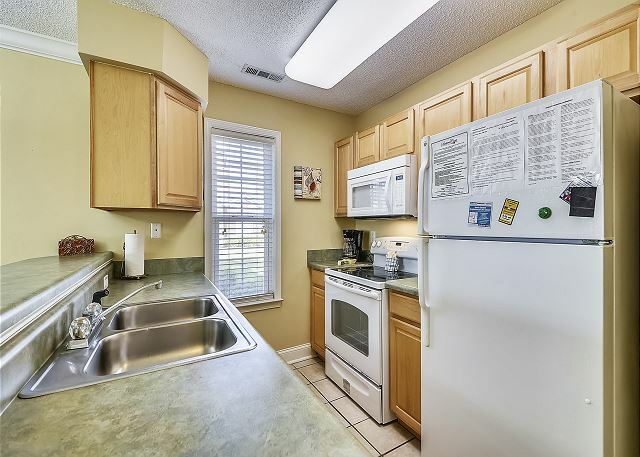 Kitchen - Fully equipped, stove, microwave, refrigerator, dishwasher. all kitchen utensils, cutlery, pots, pans, baking needs, plates and glasses. 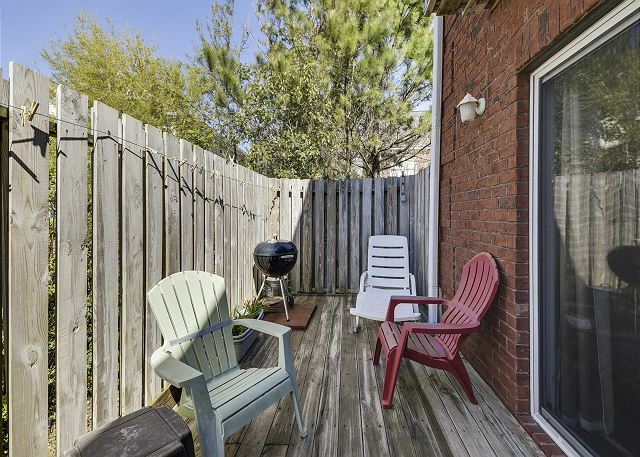 Back Patio - Charcoal Grill, table and chairs. The Myrtle Beach Boardwalk and Promenade, Market Commons, Broadway at the Beach, Myrtle Beach Mall, golf courses, miniature golf, great shopping, fabulous restaurants, unique shows, the Myrtle Beach International Airport, State Parks, and miles and miles of beautiful beaches. 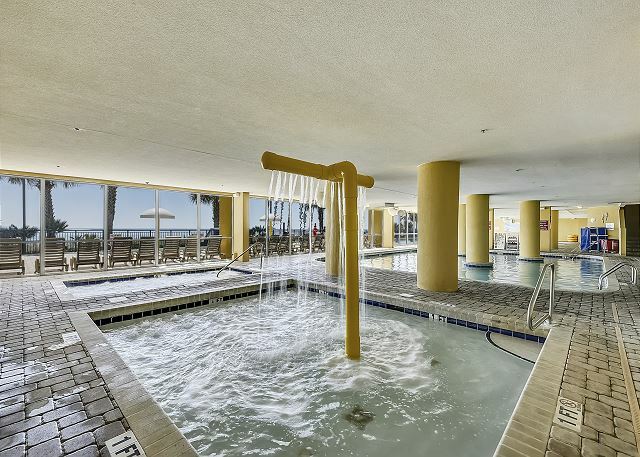 The beach, pools, miniature golf, many restaurants and stores are all within walking distance! You receive 2 parking passes and we do allow motorcycles and trailers! Always great to spend time in our winter home. The new flooring upstairs is a wonderful addition. TV upgrade was also a pleasant addition. Miss the land phone line. Did not own a cell phone so had to buy one. Melissa, thank you for your lovely review. 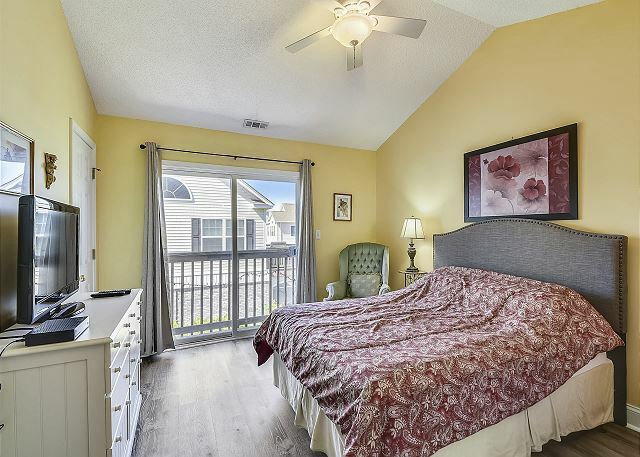 We LOVE the townhome as well, the bedrooms are spacious and we believe you truly get the home away from home feel when you stay. 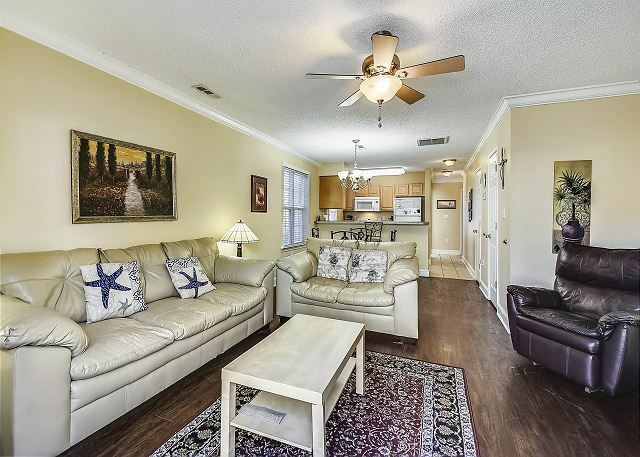 This location is centrally located and short walk to the beach. 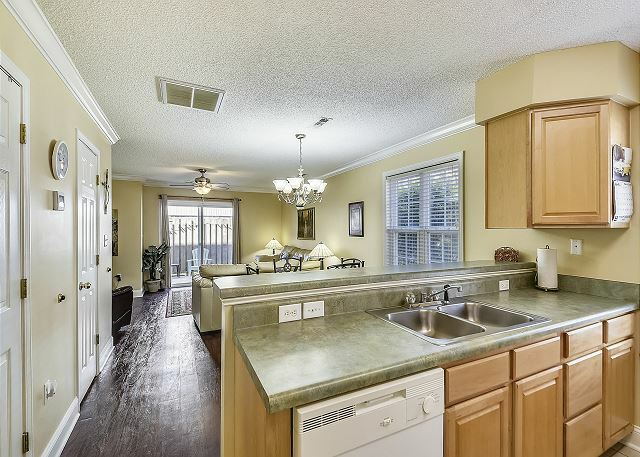 Close to many amenities, the airport, golf courses and restaurants. 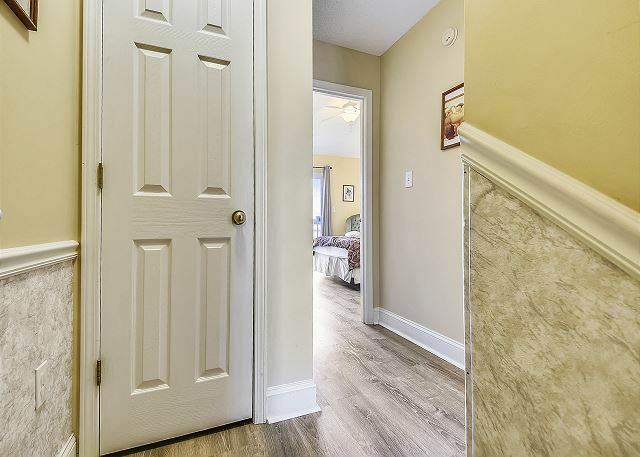 Furnishings are nice and condo well stocked with dishes and kitchen necessities- and the bonus is its pet friendly. We always enjoy our stay at the Firebird 5. We also appreciate the many up grades that have been done over the last few years. The new brighter street lights are a most welcomed addition. Looking forwards to our winter stay over 2018-2019 season. It is always a pleasure to have you as a guest. We glad you enjoy the complex and the upgrades we have completed in the past year. We hope to get the upstairs hardwood flooring in soon! Fully stocked kitchen, even left an empty cabinet to put your dry food in. 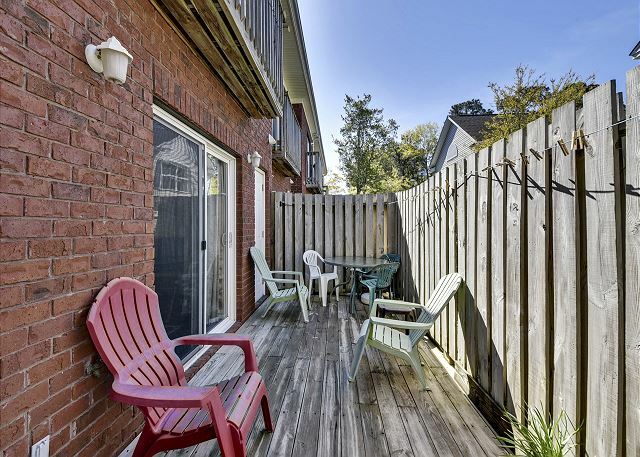 Private back patio with table, chairs, and a grill. Beds are comfortable, plenty of closet space, even left us hangers. Lovely pictures on walls, very clean and well maintained. Peaceful. 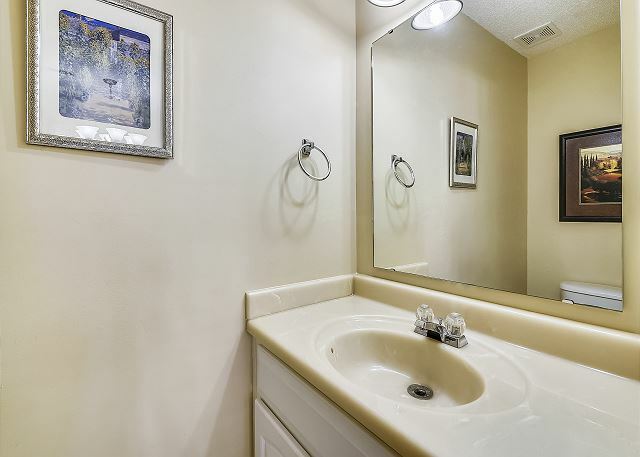 You can tell the owner takes pride in their condo. 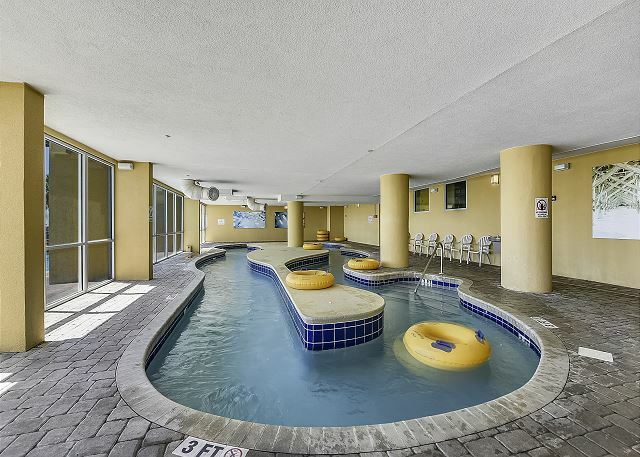 It was perfect for us, close to the beach and with pool access at the resort. 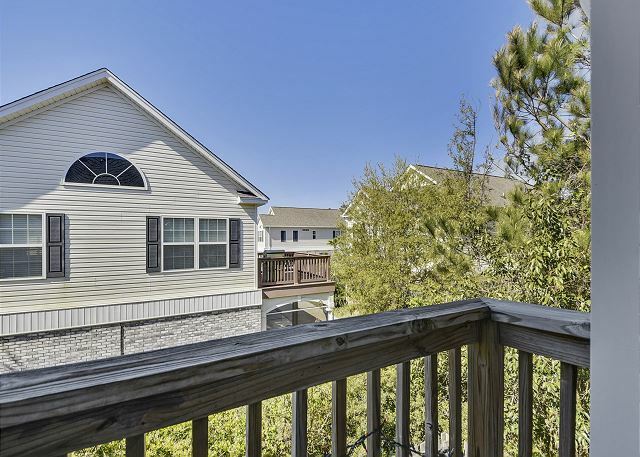 The layout is great, the deck is private, and there are many good restaurants close by. We hope to return. We enjoyed having you as our guest. Please come back and see us soon! This was our 5th time in #5, and as usual I was extremely happy with everything. I especially like the fact that it is very quiet and away from all the crazy traffic. 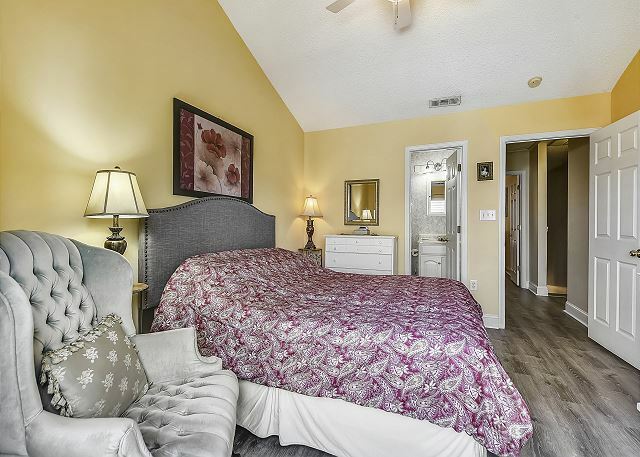 Mini golf and nice restaurant walking distance away, and beach only 5-10 min walk. I'll be back next year. Good day Damon, thank you very much for your great score and warm review. We are glad the team made a difference and you enjoyed your stay with us. We agree the location is great and We are waiting to welcome you back next year! We absolutely loved our time in Myrtle Beach! We could not have been more pleased with the Firebird property we stayed at. It was exactly as described online and exceeded our expectations. 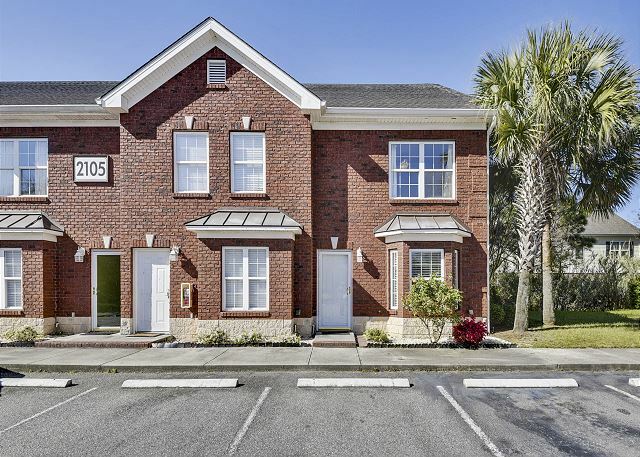 It was a lovely townhome.. spacious, clean and had all the comforts of home and literally a 5 minute walk to the beach/Grand Hotel. Being able to bring our mini Yorkie along for the trip was such a great accommodation, he loved running around on the beach every night. Watching the sunrise everyday was truly stunning and something you should definitely experience! If you're planning a stay, you MUST try Ciao restaurant for authentic and beyond delicious Italian cuisine. We also spent some time at Ripley's Aquarium and Pier 14 (very fun) But the majority of our days were spent at that beautiful beach and strolling through town. It was a picture perfect way to celebrate our anniversary and we are so looking forward to our next trip! Booking was simple and both the owner of the property as well as the management company were friendly and made the entire process seamless. We would, without a doubt, recommend! Thank you, Firebird, for your hospitality and making our very first trip to Myrtle Beach, one for the books! Thank you for staying with us, it was a pleasure having you and your pet stay at our town house. 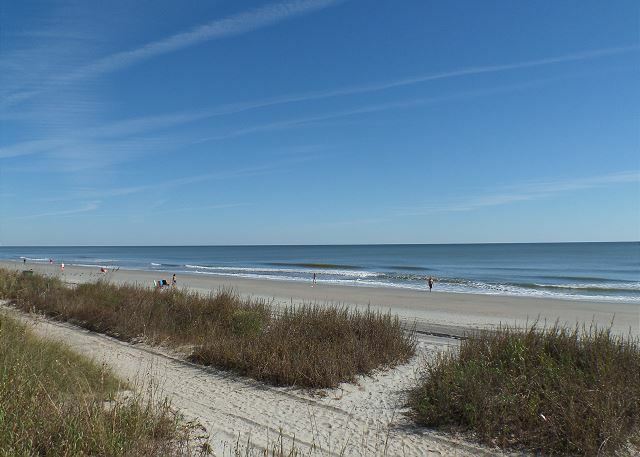 We do hope that when you return to Myrtle Beach, you will give us a call. It was fine, pretty much had everything we needed. Thanks Walter and Diane, we are happy you stayed with us while your closing on your new home was delayed. We hope all is well at your new house. Excellent unit to enjoy a family vacation. 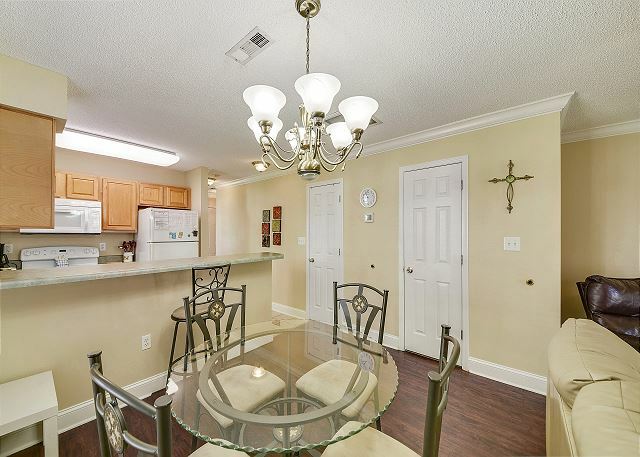 The owner has furnished the unit with a family's convenience in mind. 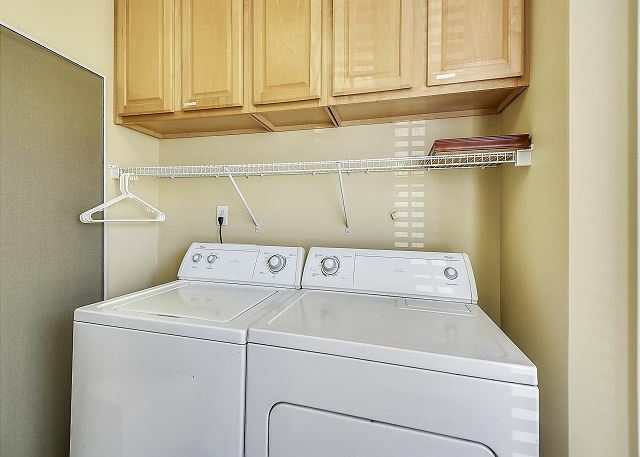 It is clean and well designed to meet your needs. 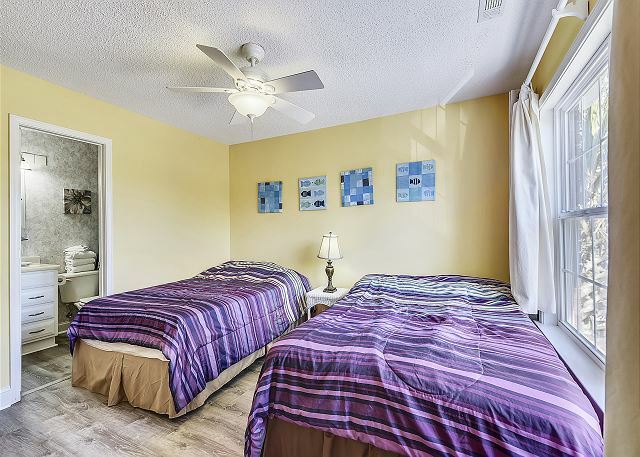 The location gives you privacy and only a short distance from the beach not to mention the arrangement with the Atlantic Hotel which makes it very favorable for young children. 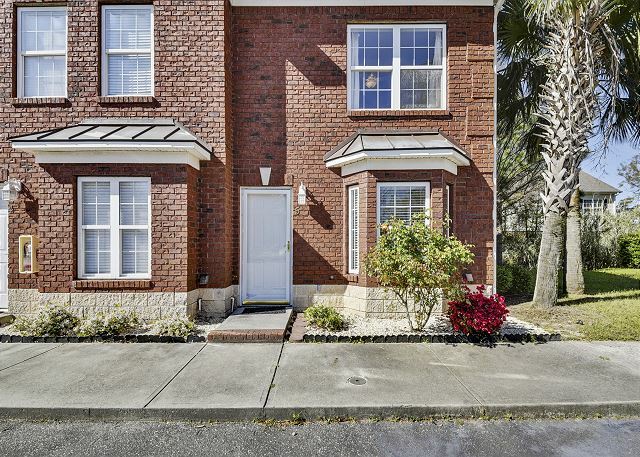 It was close to the beach, shopping & restaurants we will try to rent this same townhouse sometime in March/April of 2017. 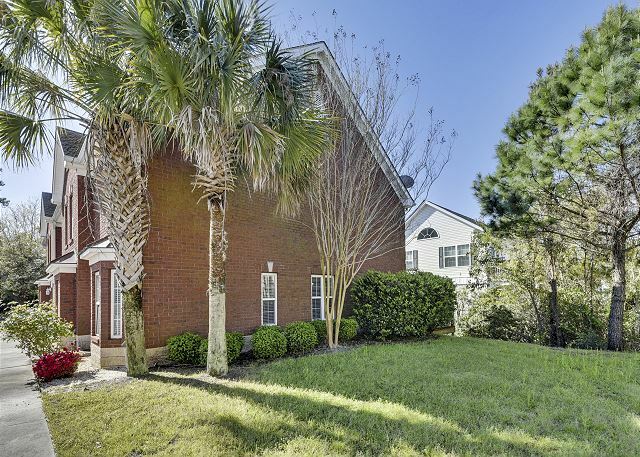 We wil be coming back to purchase a home to begin to retire in Myrtle Beach. Thank you for everything. HI Donna, Thank you for your review and feedback. 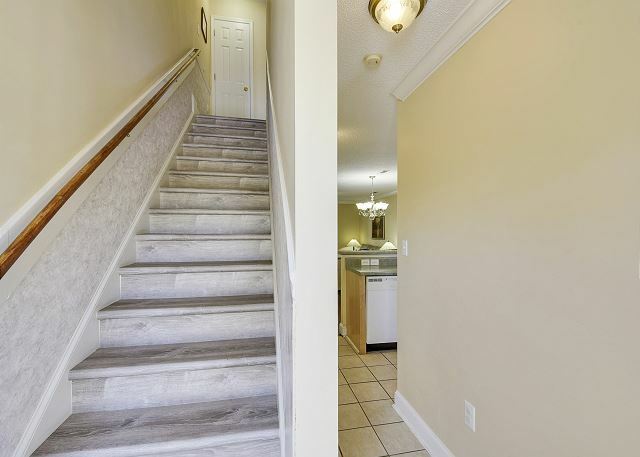 You will be happy to know we have updated the floors, we have laminate floors throughout the entire town home and we will definitely look into some new curtains. The master bedroom does have a brand new Queen mattress, but when we replace the furniture we will consider a King Size frame. Really enjoyed our stay in Firebird #5. It was comfortable and spacious for the two of us and our golden doodle. Our CCU student son and his girlfriend came over regularly to visit the beach with us. 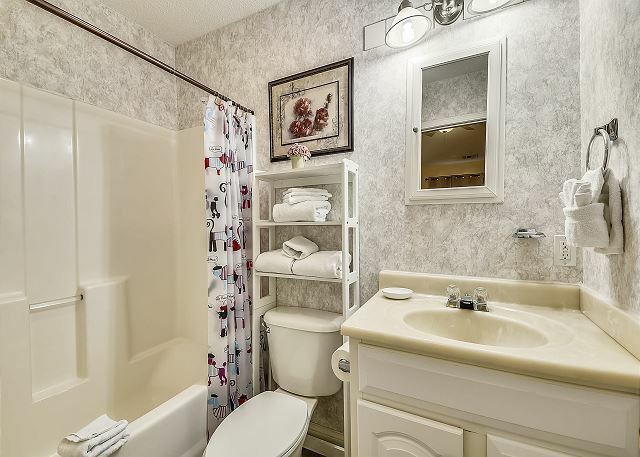 So the extra bathroom/bedroom was quite useful. 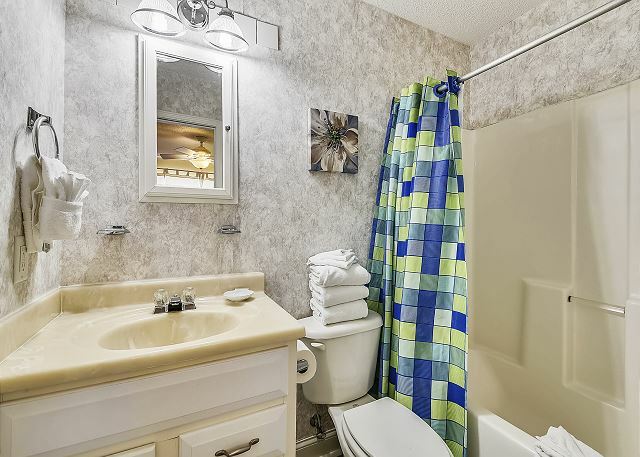 The town home itself is nicely equipped though the decor does appear a bit dated. The kitchen was well stocked with all the utensils/small electrics and such. There was also considerable cleaning supplies, toilet paper and paper towels though the info from the agency says to bring all the above. Only minor gripe was that the ice maker in the freezer never worked. To be fair, we never did report this to the agency so I don't know if they would/could have fixed it during our stay. 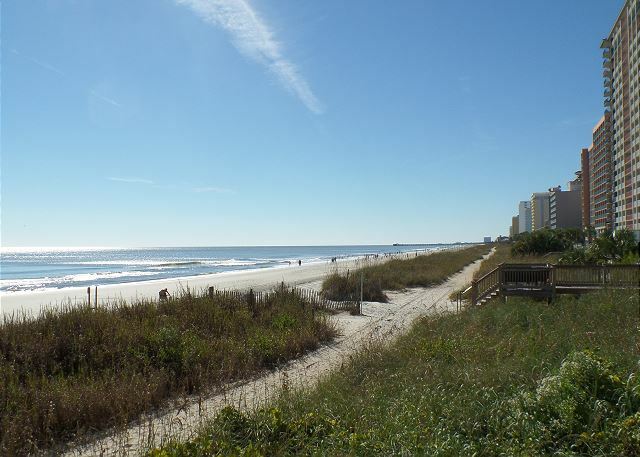 The beach is two blocks away which we found very convenient but also far enough that the Ocean Blvd traffic was of no concern. Thank you for choosing Southern Coast Vacations and Firebird 5! We hope that you will stay with us next trip! 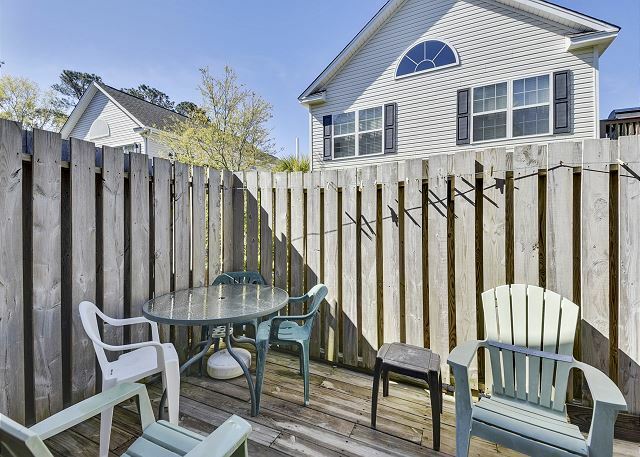 A few minutes to the beach with no noise and privacy. Just what we wanted. We will reserve again. Thank you for choosing Southern Coast Vacations and Firebird 5 for your vacation! Hope to see you soon! We love having you stay in Firebird 5 and look forward to seeing you next winter! We stayed in this well equipped townhouse for two weeks in early October. It is spacious, nicely furnished and very comfortable. The service received from Southern Coast Vacations and Jennifer in particular was superlative - including response to a leak under the sink. 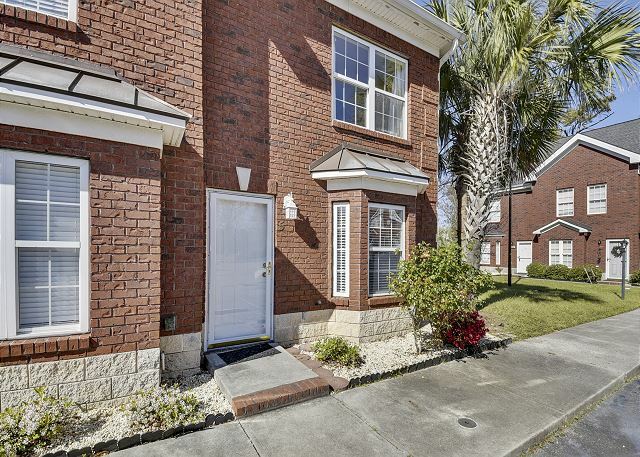 Our one suggestion would be that the townhouse requires some TLC. The vertical blinds are in bad shape and need replacing. The deck is getting fragile in places and needs some repair. Carpeting is looking its age. The unit is well located. I was a bit disappointed to find that the fitness centre at the Atlantic Grand was not included for guests as was stated in the listing. However, the pool facilities were superb.